The GFS Projects Limited Unmanned Aerial vehicle (UAV) GFS13A is able to take off and land vertically; it can hover at heights up to eighty feet. The GFS UAV uses the Coanda principle to create lift, it has very little downwash and is aerodynamically stable. Aviation pioneer Henri Coanda observed in the 1930's that the flow of air will follow a curved surface, rather than just continue in a straight line. 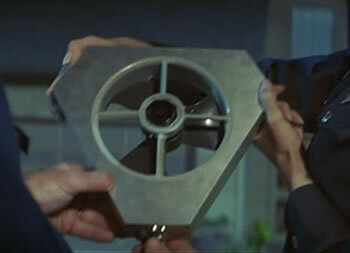 This particular device not only reminds me of flying saucers, it reminds me specifically of the cool floater camera from the 1985 movie Runaway, directed by Michael Crichton. However, for fans of real live flying saucers, it turns out that GFS Projects Limited intends to produce a large-size version suitable for a single pilot. 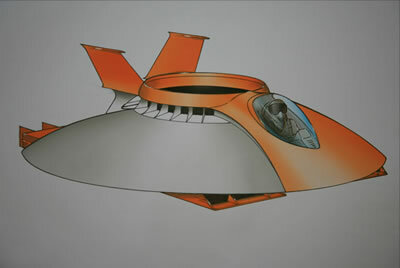 The ability to take off and land vertically, and to hover, is essential for any kind of personal flying vehicle. Via Wired; thanks to Moira for contributing the tip on this story.